Jane Chapman is at the forefront of contemporary harpsichord practice, both in terms of the performance of older repertoire, and in the reinvigoration of the instrument, which she makes possible through extensive commissioning and performance of new works. Following her recent appearance as accompanist on NMC's Songbook project, Chapman now releases a disc on the same label, this time dedicated to new repertoire exploring the potential of the instrument in modern terms, in transforming alliance with electronics and extended playing techniques. The release focuses on works from younger British composers, with James Dillon and Roger Redgate being perhaps the most established of the represented composers. The Sonic Art Research Unit at Oxford Brookes University developed the Wired project (named for its threefold implication of agitation, of the importance of wire, and of electronic underpinning). As such, the release features works by associated composers Paul Dibley, Paul Whitty, Paul Newland (each of whom contribute two), and Sam Hayden. 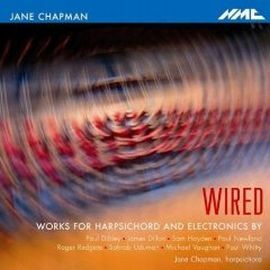 Wired features a consistently engaging set of performances that are united by Chapman's searching musicality, and by the persistence of the harpsichord through each transformation as centrifugal timbral and mechanical resource. This persistence does not imply rigidity though. The simple but effective scale of the experiments featured here is exemplified in Paul Whitty's two seven page pieces. In the first instance the mechanics of Ligeti's Continuum are revealed by removing the sound of the plucked strings to foreground the surprisingly musical labour of hitting keys in sequence-kind of like a work song for the lone experimental musical artisan-whilst the second uses various signal processors to ignite and whirl in still tumescence each of the F# notes that occur on page five of the score of the same piece. Paul Dibley makes extensive use of live electronics (which he performs,as do the other composers within their own pieces), pre-recorded tape, and live harpsichord sound in his animated and explorative INV III and INV I. The first of these builds from simple harpsichord material set in a feedback loop with ricocheting background noise, before amassing a shape-shifting shadow play of mechanical and electronic sound. The second holds the two strata at more of a distance, more as partners than as unity, though an interesting tension pervades the piece that suggests a fruitful coupling of the two, which is nevertheless always thwarted. James Dillon's miniature birl, Roger Redgate's Residua, and Sam Hayden's scintilla are the only works to eschew electronics in performance. Of these, Redgate's is the most extensive; across its six short movements Chapman vividly explores a range of textures and timbres, before the final cumulative valediction. What Hayden's scintilla lacks in expanse, it more than makes up for in frenetic, wiry, energy. The other works in the disc impress too. Paul Newland's highly restrained, contemplative two pieces for harpsichord, e-bow (an electromagnetic device usually used by guitar players which coaxes resonance from metal strings), and amplified tuning key, 1-4, provide contrast in the programme. They subtly withdraw the listener into a world of isolation and stark repose, which commingles well with the adjacent worlds of Mike Vaughan's In Memoriam and Sohrab Uduman's Breath across autumnal ground. The first of these presents a thrilling melange of the live, the pre-recorded, of highly defined figuration, and of freely improvised fogs, all of which Chapman navigates with nimble precision. Uduman's piece meanwhile contrasts with the others in that it uses computer software in a quite candid, stripped-back manner, to foster a stretching out and extension of the sound of Chapman's austere and yet expressive harpsichord.